It’s a comforting, deeply satisfying feeling. But what happens if we are surrounded not by full grain bins and root cellars stacked with food but problems, disappointments, trouble? What if we don’t see blessings…but fleas? You remember the story; it’s one of my favorites. During World War II, Corrie ten Boom and her sister, Betsie, were imprisoned for helping Jews to escape the Nazi persecution. Among the many horrors of prison camp, they found their barracks were infested by fleas—in the bedding, in the walls. Everywhere. These fastidious Dutch women recoiled in disgust. However, since Paul directs us to “give thanks in all circumstances,” they gritted their teeth and gave thanks anyway. Even for the fleas. I don’t know about you, but my life feels a bit flea-bitten at the moment. My health challenges just go on and on. Nothing life-threatening: neither are fleas. 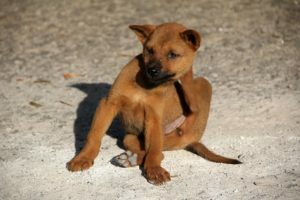 But ask any dog: if you get bitten often and hard enough, you end up feeling pretty miserable and sorry for yourself. I just want to be “all better,” but that doesn’t seem to be happening. Yet Thanksgiving is coming up. Like Corrie and Betsie, I feel the weight of Paul’s directive to the church in Thessalonica. When he said all circumstances, he meant ALL—good and bad. And he knew the people he wrote to weren’t living in a rose garden. Rejected by their community, suffering economic and personal persecution for their faith, they faced a constant threat of arrest, torture, grisly execution. Tradition has it that Paul himself died a martyr’s death in Rome. Yet Paul told them to give thanks. Why? Because he knew God is good, that God loves us and His plan for us is good, no matter how it may seem. We may not be able to thank Him for the circumstances but we can thank Him in them. So I, too, can give thanks—not for the fleas, but because He is God and He knows what He’s doing. When I quit whining, I can also see how He’s helping me get through my difficult circumstances: good, competent doctors, kind family members who are helping me deal with my allergies, a husband who patiently drives me to the hospital yet one more time. Oh, and you remember the end of that story. Since the Nazi guards, equally fastidious, gave their flea-filled barracks a wide berth, they didn’t find the precious Bible Corrie and Betsie had smuggled in. With it, these faithful women were able to minister God’s love and comfort to their fellow-prisoners who were dying daily. God’s plan and purpose is simply greater than we can see. He does not expect us to understand it—just to trust Him.